Scarves by their nature are very fragile and soft clothing articles. Treat them gently unless you want them to rip! With this Easy Hang Scarf or Belt Holder, it has velvet-like lining in the loops to make sure those scarves rest against a soft material. Scarves that are worn as fashionable clothing accessories need to be treated with extra care, as obviously they're not as hardy as winter scarves. This hanger for college closets can also of course be used to hold belts or other college items. Ties, for example, don't look the best when they're tossed aside and left to get wrinkled up. The answer? 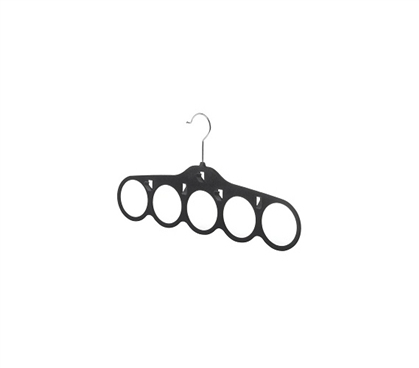 You already guessed it: this convenient college hanger. Items like belts and scarves are also easy-to-lose college clothing articles. College closets have a knack for swallowing up clothing articles and smaller dorm items—which is what can easily happen to those ties and belts if you don't keep them properly stored! While you've probably already included plenty of basic closet hangers in your college supplies, a different and unique hanger like this Easy Hang Scarf or Belt Holder is just what's needed to diversify those college closet supplies. So don't spend half the morning trying to find that scarf or belt. Keep it right in one of these five loops and you'll always know right where you left it.